There are currently 30 users and 1510 guests online. Shore Catch is a Western Australian family business that aims to provide unique products and services to the local fishing community. Our mission is to identify existing shortfalls in product and service delivery and supply those markets in a friendly, efficient and cost effective way. We create custom clothing for aquatic based activities. We work with you to design what you need and can produce a high quality product for many applications. Our products are manufactured in Western Australia to ensure quality for our customers and are not cheap imports. We are flexible and offer personalised service through the whole design and supply process. We offer a stock range of logo free fishing shirts for purchase via the internet. We do not understand why you have to pay top dollar to advertise for a business and produce good quality merchandise for a market price. We are currently offering stock shirts at near cost to Fishwrecked Members to promote our brand. Please support us and see the website for specific details. We can also supply and custom install Minn Kota electric motors to your boat in Perth. The electric anchor and programmed slow drift features of the motors is exceptional but there is no current service that can properly advise what is specifically required. We can provide that service in a practical way. Burley is key to attracting fish to your baits. We are currently obtaining the relevant licences for manufacture and supply of high quality burley in Western Australia. Our product will be unique in the local market with a tested recipe at a fair price over a range of size options. Shore Catch will operate from a retail outlet in the last quarter of 2015. Our products and services range will diversify and we look forward to advising location, and the specific additional products and services, to members in due course. We are proud to be a sponsor of Fishwrecked.com. Just a quick note to let any business owners out there know that we have a discounted advertising rate running on the site until Christmas to celebrate our 10th anniversary of operation. The rate is $30 cheaper for the month than we charge hourly for a tradesman in Dampier if you want an idea of the pricing. For our members, please also utilise our sponsors, I strongly believe in supporting local businesses that provide great customer service to you guys. They often do it tough against online shopping where service isn't as much of an issue and overheads basically don't exist so they can offer extremely cheap prices. I really believe in having the ability to go to someone face to face to talk about the service/product you are looking for and have chosen our advertisers on that premise. Razerline has been Western Australia’s premier aluminium boating company for the past 30 years. Our award-winning business is fully equipped with boat repair, design and manufacturing facilities, while our crew is knowledgeable and experienced, ensuring we meet the needs of all your boating requirements. The Razerline brand is recognised and respected in the boating community as all our boats are hand-crafted, with careful attention to detail. Our clients’ boating preferences range from commercial crafts to the favourite – Razerline’s 7.2 Olympian -, and custom designs. We design, manufacture, repair and sell recreational and commercial aluminium boats that meet the extremely high industry standards. We offer several services that include boat alterations, customisations and our excellent warranty on all goods and services to all clients including commercial owners, charter- and tour operators and government departments. Please make welcome our new site sponsor, Epic Marine & Restorations. A lot of you would have heard of Todd over the years and some of the sick boats he makes, make sure you check out his work! Epic Marine & Restorations Mandurah is locally owned & operated and have built an average of 300 boats ranging from 4.2m dinghies to 7.5m hardtops. With 20 years of experience and welding certificates, passionate owner Todd Lubbock likes nothing better than sitting down with a client to work out what is required, homing in on the personal touches available only to people who work closely with a boat builder. Epic Marine also specialises in restoration work on Boats, Cars, Busses & Homes. Todd encourages clients to come down and visit his workshop during various stages of construction to ensure that the finished craft is exactly what the customer is after. Please make welcome our new Site Sponsor - JETPOWER Boatshop. Jetpower Boatshop’s 1,400 square metre dealership is home to the full range of Yamaha Outboards, Haines Hunter Boats and Yamaha WaveRunners, new Yamaha spare parts and accessories. Over many years we have built a reputation for excellence in service and customer satisfaction and pride ourselves on offering value for money packages. Most of our spare time is spent on the water using the very products we sell. Jetpower Boatshop, a family owned business, was established in 1995 and our team have been involved in the marine industry in Western Australia for over 40 years combined. This enables us to understand our clients requirements for the perfect day on the water. We ensure we stay up to date with the latest trends, information and technology. It is our passion for the water that allows us to customize your boat or jet ski to your exact needs be it new or used. Jetpower Boatshop is also a preferred supplier and service centre for Surf Life Saving Western Australia, Whitfords Volunteer Sea Rescue Group, and a member of the Boating Industry Association of Western Australia (BIAWA). Fishwrecked.com 10th Birthday coming SOON! Fishwrecked.com is coming up to its 10th birthday in the coming month and being WA's largest fishing website and one of Australia's largest, I am looking to do some give aways and have offered a 10 year special on advertising rates to get some fresh advertisers in the door to offer you guys better service, products, discounts and giveaways. Hopefully there will be some more announcements in the next few weeks and if any of you have any thoughts for competitions, donations or advertisers I am happy to hear them to make it a 10th birthday to remember! Please make welcome our new site sponsor Fishing Western Australia (FWA) Protackle. Most of you will have seen their adverts on the show, but now they are apart of WA's largest fishing website. You have seen them on TV, Hydrocynus vittatus , the striped water dog. Teeth, stripes, orange fins, probably one of the most beautiful fish in Africa. As an ex Zimbabwean now happily settled in Perth, I can't help but want to share the thrill of catching tiger. Myself and my contacts back in Zim have come together to offer you the opportunity to experience the magic of the Zambezi River and its wildlife. You have three lodges at your disposal, each with its own special features. SIDINDA, is the fishing lodge, situated on the Zimbabwean side of the Zambezi, this lodge has access to some of the best tiger fishing available. This stretch of river is diverse, with rapids, deep pools and sandbars. The fish species are numerous, with Tigerfish, Vundu and Bream being the main targets. The fishing season runs from late August to mid November. BOMANI, is the game viewing lodge. A small pan with luxurious tented chalets situated around it. Sit around the camp fire in the evening whilst you watch wild elephant come out of the bush like grey ghosts to drink and play in the mud. GORGES is a breath taking lodge. Situated on the very edge of the Batoka Gorge, every one of the ten chalets has a view of the Zambezi River 250m down at the bottom of the gorge. Gorges Lodge is a 20minute drive away from Victoria Falls, where you can tour the falls or take part in adrenaline activities like white water rafting. I have personally spent time at all three of these lodges. They are operated and run by experienced staff who will do whatever it takes to make you feel comfortable and enjoy the experience. Feel free to look up Gorges Lodge, (recently ranked #1 specialty lodge) and Bomani Tented Lodge on trip advisor http://www.tripadvisor.com.au/ to see what previous guests think. Choose from a package or have us tailor one to suit you. If it's just one lodge you want to visit, or all three, we can make it happen. Below is a list of packages and prices currently available. Includes all transfers, meals, local beers, wines, soft drinks and spirits, laundry, game walks and game drives, 1 shuttle per paying night from Gorges to Victoria Falls town, fishing guide and boat, fuel and fishing bait. Excludes: International flights. Activities in the falls whilst staying at Gorges Lodge. Fishing gear. Includes all transfers, meals, local beers, wines, soft drinks and spirits, laundry, fishing guide and boat, fuel and fishing bait. Excludes: International flights. Fishing gear. Includes all transfers, meals, local beers, wines, soft drinks and spirits, laundry, game walks, game drives, safari guide, visit to local village and tour of village school. Includes transfers ,from and to Victoria Falls airport, 1 return shuttle to Victoria Falls town per paying night, all meals at Gorges Lodge, local soft drinks, beers, wines and spirits, laundry. Activities prices: As a ROUGH GUIDE ONLY, you can expect to pay $30 for a tour of Victoria Falls and up to $150 for an activity such as a half day elephant back safari or white water rafting. We will discuss and book your activities before you fly out. Please contact us if you require further information. We can quote a custom package just for you! Please contact us with your requirements and we will be happy tailor make an itinerary to suit your needs. 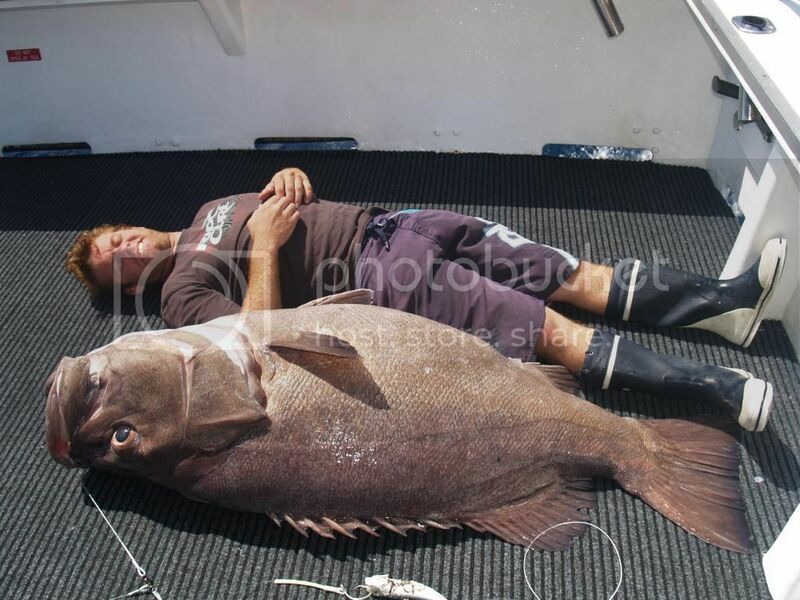 52.50kg Bass Groper yesterday 31/1/2014 * Pending WA & Australian record!! Good mate Steve enjoys fishing out in the super deep and does well. We were talking recently and he said " I want to get a big bass groper Ryan "
No worries I have a few cheeky spots that hold fish ie 30-40kg Bass Groper so lets go when the weathers suitable. Steve mentioned he was going away for work and Friday (31/1/14) was ther only day! I said the weather is very average but Steve owns a 53ft (Nebraska Charters) and he said common mate let's do it ....... mmhhhhh ok!!! We threw ropes early ie 4am and off we went, we pulled a few fish from Steve's spots ie greyband etc but Steve was keen to hunt for a bass! By now the wind was up (even more) and I said we'll go to this spot and give it a go ...... searching searching searching and nothing! I said I've got another spot near by and its a bass lump with hard limestone and a hidey hole for a biggen! A quick steam and we were back to searching ....... the Furuno sounder looked the goods and I said that's gotta produce ...... Steve drops and within a short time of the baits being on the bottom Steve was on! After about a 45 plus minute fight (maybe longer) a massive spa bath of bubbles was hitting the surface about 40 meters out from the boat and one very very big bass groper on the surface! We gaffed it and it took every bit of help to get it over the gunnel. 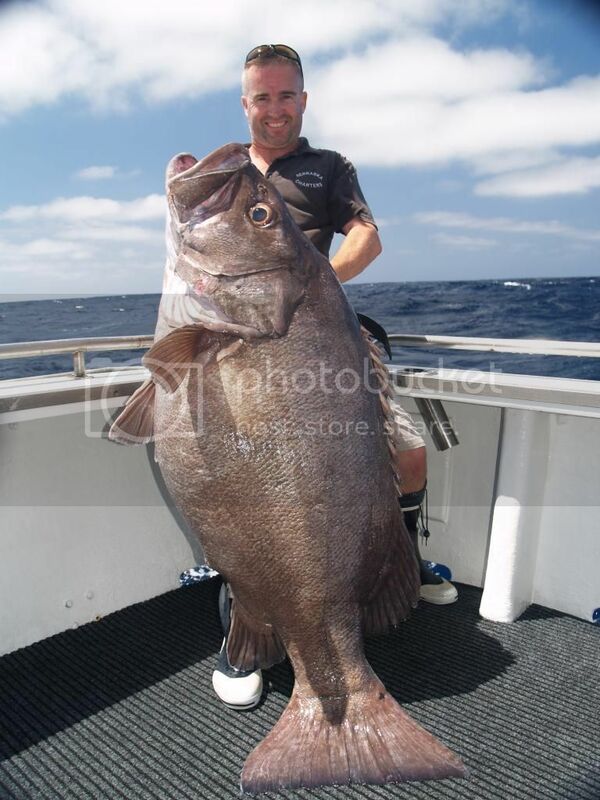 I said to Steve that's bigger than the State record which was 46kg on my boat by kasey back in 2009! We got it to my home and weight it on very accurate scales( ie the one I used with Kasey State record fish) and it read 52.57 but after 3 times it fluctuated by a kilo but close enough! Steve went into MAAC club after leaving my house and they weighed it on Certified scales and went 52.50kg and a pending new State record and Australian record as the Australian record is 49kg in NSW 2004! Please make welcome our new site sponsor, Compleat Angler & Camping World Nedlands. Compleat Angler & Camping World Nedlands are proud to be the newest sponsor of Fishwrecked.com. We'll be offering exclusive specials to all FW members on the forums as well as a FW member only discount on most items in store. Please be sure to mention you're a FW member so we can give you the best deal. All our friendly staff members are passionate fisherman who are out on the water shorebased, in kayaks and boats multiple times a week. Be sure to Like us on Facebook and Follow our Instagram Feed. ** Saltwater Fly Fishing both locally and in the tropics. ** What's biting at the moment, where and how to target them. ** Teaching you how to rig for success - everything from Game/Jigging/GT/Deep Drop to Saltwater Fly Fishing and Bream Fishing. ** Species & Location specific Artificial/Lure selection help to get best results. ** A huge selection of fantastic quality bait. We're open every day of the year apart from Christmas Day and Good Friday. 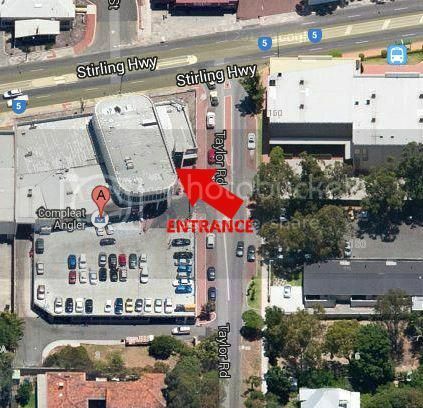 We are located 154 Stirling Highway, Nedlands above the IGA Supermarket and our phone number is 9389 1337. Access to the entrance (stairs and lift) and parking is from Taylor Road. We look forward to meeting the members of FW and don't forget to mention you're a member so we can give you the best deal!